PHILADELPHIA, PA – Neat®, a recognized leader in business document and bookkeeping automation solutions for small businesses, recently announced it has entered into a strategic partnership with the Fujitsu Corporation and their ScanSnap® brand scanners. The two companies will be offering a bundled solution that brings together the industry’s most popular scanner with Neat’s cloud-based software for expense, spend and document tracking and management. The bundled solution is available for purchase through Amazon.com. 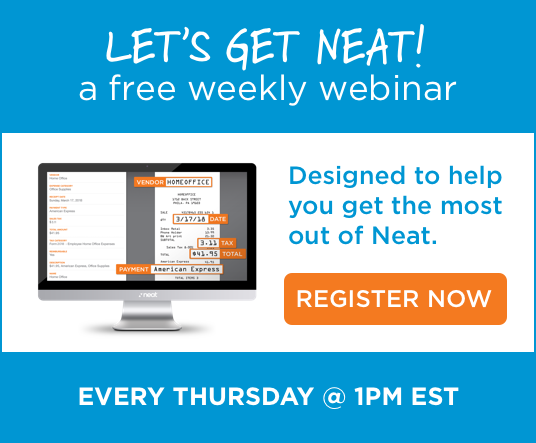 About Neat®: The Neat Company provides small businesses and sole proprietors a cloud-based expense and document management system, which streamlines the collection and retention of important financial documents, automatically extracts key information, and provides real-time insights to automate time-consuming bookkeeping tasks. Neat’s patented ID2 technology intuitively classifies documents and populates key data fields, helping small businesses organize and categorize financial information that is critical to their business’s needs. In order to manage the high, daily volume of expense transactions and financial documents, Neat gives small business owners the power to capture and access files from any device, taking productivity to the next level. By consolidating reporting and eliminating time-consuming tasks like data entry, Neat streamlines accounting and tax-related workflows, giving time back to small businesses so they can get to what matters most. About Fujitsu: Fujitsu Computer Products of America, Inc. is an established leader in the Document Imaging industry, delivering innovative scanning products and services that enable our customers to solve critical business productivity issues and streamline operations. Fujitsu provides cutting-edge document capture solutions for business and personal environments, backed by a comprehensive portfolio of service and support programs.